Over the last several years, 188Re has arisen interest in Nuclear Medicine due to its physical and chemical properties. From the Physics perspective, 188Re (t1/2 = 17 h) decays into an excited state of 188Os by emission of β-particles with maximum energy of 2.1 MeV, making it suitable for radionuclide therapies. In addition, 15%-abundant photons (155 keV) are emitted after de-excitation of the daughter nucleus allowing to image the bio-distribution of 188Re using SPECT and performing accurate dosimetry calculations. From a chemical perspective, 188Re shows a rich coordination chemistry and a close resemblance to -its group congener- 99mTc. The goal of this study is to investigate 188Re image quality and image quantification in VECTor/CT by performing a series of phantom experiments using different collimators. This research project aims to develop a novel radioembolization agent for treatment of hepatocellular carcinoma (HCC). 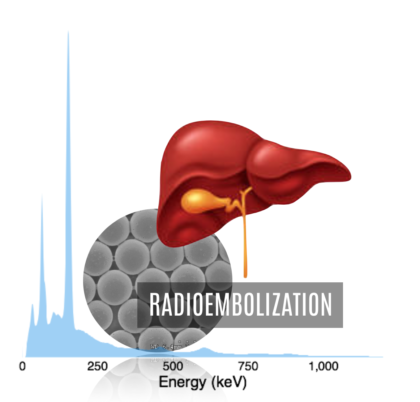 Radioembolization consists on the administration of microspheres labeled with a b-emitting radionuclide directly into the hepatic artery, which provides 80-90% of blood supply to the tumors. Based on their size, the microspheres are trapped in the small blood vessels surrounding the tumors, from where they irradiate and destroy them. The study and characterization of these spheres by SPECT/CT and biodistribution is the goal of this project. 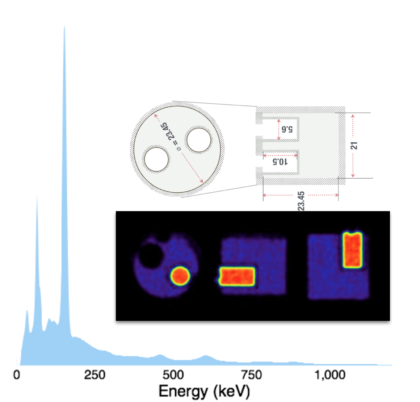 Unlike positron emission tomography (PET), which relies on 511 KeV coincidences resulting from positron and electron annihilation, single photon emission computed tomography (SPECT) detects a wide range of gamma rays from 10 KeV to 350 KeV. Therefore, dual isotope imaging can be performed with SPECT by using two different isotopes with well separated gamma ray emission energies in order to image two different biological or molecular targets simultaneously under same physiological conditions. However, sometimes the main limitation of the dual-radioisotope imaging is the crosstalk between the two radionuclides. To overcome this limitation, our VECTor scanner offers PET/SPECT dual-tracer imaging which opens new possibilities for the design of novel preclinical protocols. Most of our projects combine radioisotopes with differentiable gamma ray emission energies for in vivo identification of several cancer stem cells, monitoring radiopharmaceuticals integrity or payload release, and evaluating correlations between different biological events in a living subject. The positron-emitter 89Zr is a suited radionuclide for antibody-based immuno-PET imaging procedures. Its physical half-life (3.27 days) matches the biological circulation half-life of full-size antibodies well and the positron-energy provides good PET image resolution. 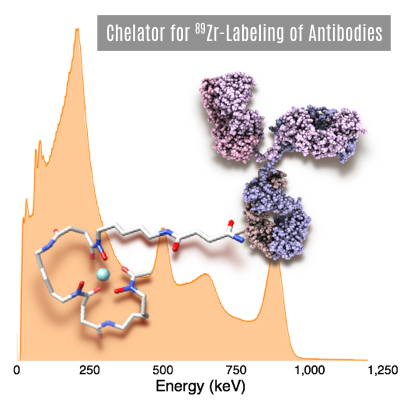 In order to bind 89Zr to an antibody, a bifunctional chelator is the most common strategy. A number of bifunctional chelators have been developed, and we are currently investigating their in vitro and in vivo stability as well as their in vivo biodistribution in small animals.